The annual subscription is £40. Which is equivalent to £1 per week. The shop sells tools veneers and sundries at low prices. Tea or coffee is 20p. We have an annual Group competition to exhibit our work. The winners of which go on to represent us in intergroup competitions with Harrow, Chelmsford and Redbridge Groups. 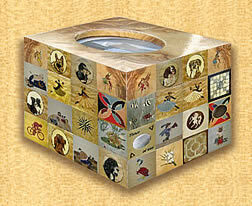 To advertise the craft of marquetry we attend local craft fairs and fetes. Those members who join the Marquetry Society enter their work at the Annual National Exhibition which is the highlight of the year. 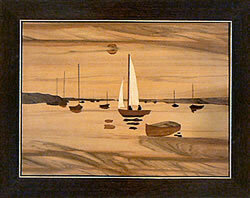 Over the past forty odd years many interesting characters have demonstrated their marquetry skills at St Albans Group. You will be pleased to know that a gallery of member’s pictures – past and present, is now available in the following pages. The St Albans Marquetry Group meet every week from the beginning of September to the end of June to teach and continue practicing the art and craft of marquetry. There is a lot of interaction between members who, after learning the accepted methods, share their own ideas to produce a desired effect. On the left you see an inter-group meeting at St. Albans with a few members from other marquetry groups. We meet at The Greenwood Park Leisure Centre, Tippendell Lane, Chiswell Green, St Albans, on Wednesday from 7pm to 9pm. There is an ample car park and for members who have no transport, we arrange a lift where possible. New comers to marquetry are given a 14 week structured course, during which they are given one to one tuition on all the techniques of marquetry and parquetry. All the veneers to produce their first picture are provided free from the group’s shop. Below is an example of a first picture. Click here for a Map of area where St Albans Group meet.